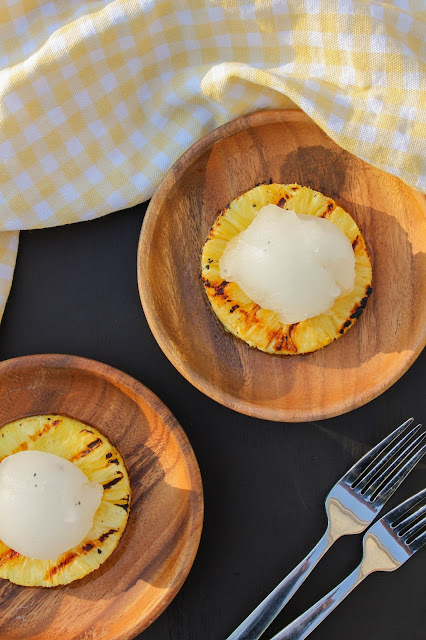 This simple grilled pineapple with homemade vanilla sorbet is not only delicious, but it's light and refreshing, too. With just a few easy ingredients, you can impress your family and friends with this dessert all summer long! I don't know about you, but I've been grilling up a storm lately! My grill has been getting a great workout. From lots of burgers to steaks and chicken, I've been enjoying the beautiful spring weather and the opportunity to be outside on my deck. Grilling is my go-to cooking method in the summer because it's so darn easy. You can grill your proteins, veggies, and even desserts, which means less clean up in the kitchen! I don't know about you, but I'm all for that. Speaking of desserts, have you grilled dessert before? There are actually many options, but one of the easiest for me is grilling fruit. 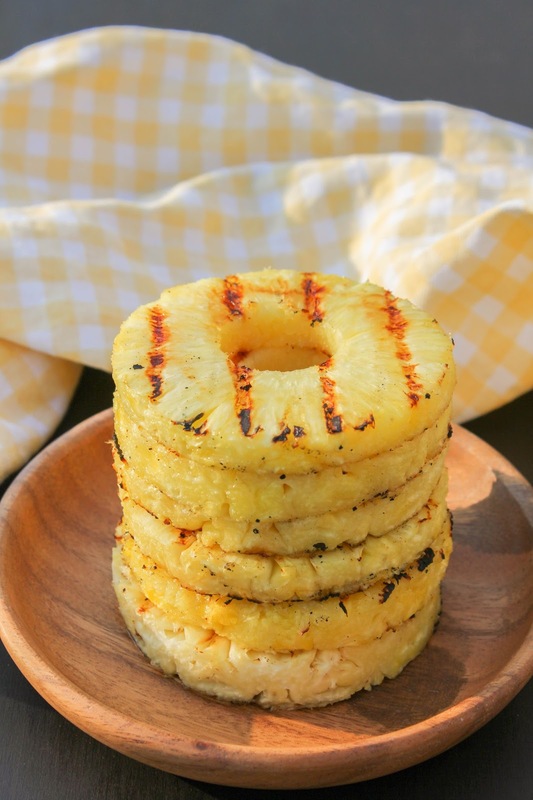 I especially love grilling pineapple, as it brings out the sweetness and juiciness of the fruit. And those grill marks? Those are the most beautiful things I've ever seen on a piece of fruit. Simply stunning. 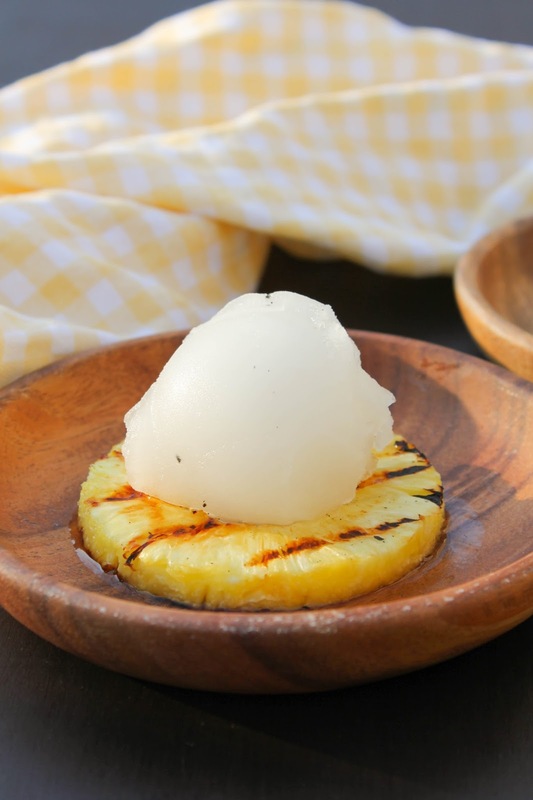 With summer right around the corner and the temperatures heating up, I decided to make a simple vanilla sorbet to go with my grilled pineapple. Really, all you need for this sorbet is patience. It only contains four ingredients. Did you hear that? FOUR ingredients. The hardest part is waiting for it to freeze! Trust me, no one feels the struggle as much as I do, because I am not a patient person when it comes to my food. Especially dessert! I love that you can see the little flecks of vanilla beans throughout the sorbet. You can make the sorbet a day or two, or even a week, before you want to serve this dessert. 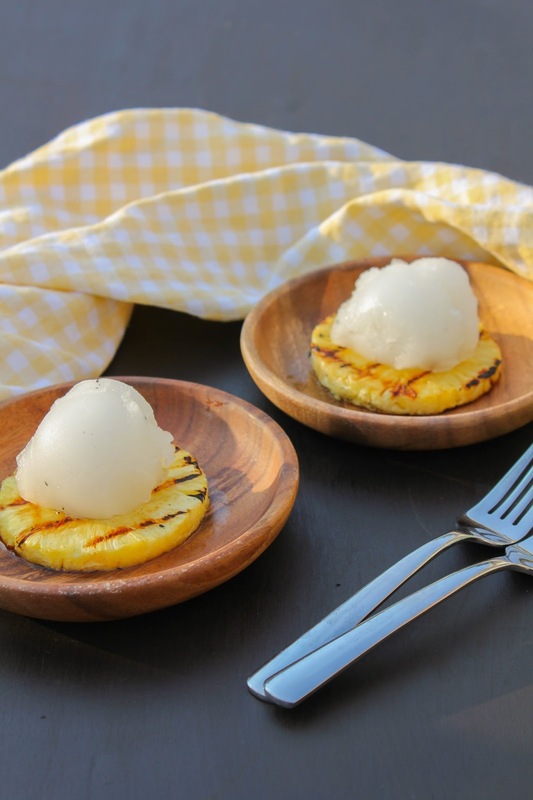 The pineapple can be grilled in just a few minutes, then top it with the cold and refreshing sorbet for the finishing touch. It really is so simple to make, but it will leave your family and friends in awe. This week our Sunday Supper theme is Throw Something on the Barbie. Check the end of this post for delicious grilled mains, sides, and much, much more from my Sunday Supper friends! First, make the sorbet. Add the water, sugar and corn syrup to a medium saucepan over medium heat. Make a cut down the center of the vanilla bean and gently open it up, exposing the seeds. Scrape the seeds into the pan, then add the whole vanilla bean as well. Cook until the sugar dissolves, stirring frequently, about 6-7 minutes. Remove from the heat and allow to cool slightly, then cover and chill completely. Remove and discard the vanilla bean. Pour the mixture into the bowl of an ice cream maker and freeze according to the manufacturer's instructions. Pour the sorbet into a freezer-safe container, cover and freeze for at least 4 hours or until firm. When ready to make dessert, heat the grill to medium and lightly oil the grates. Grill the pineapple slices until grill marks appear, about 10 minutes, turning once. Place a pineapple slice on a plate, then top it with the sorbet. #SundaySupper Throw Something on the Barbie!